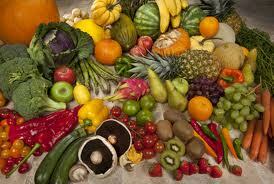 These are foods processed - receiving something they did not get from Mother Nature. Almond milk, whey protein powder, ham and protein bars - well, they are obvious. But chicken and salmon? How can they be unprocessed if they are color injected, radiated, and farmed raised on food not on the animal's natural diet? Greek yogurt does not exist without some processing. Skim milk has vitamins added, it is pasteurized and we all know about the antibiotics in cow's milk. (which were not necessary when cows were fed their natural diet of grasses - it only came about because they are now fed corn - which is not natural to their digestive systems). Canned pumpkin just contains pumpkin, but it is mashed and cooked before canning and who knows what canning does to it. Bread does not exist in nature, although the ingredients of the bread can be natural. Extra virgin olive oil - unless I am paying through the nose for a tiny bottle I can be sure it is processed oil - not matter what the label may read. I am going to try eating only unprocessed food for one day. For one full day I will eat foods that exist as Mother Nature (in all her wonder and insanity) created them. Where available I will purchase organic (for this one day). I will only consume food as it exists in nature. I can cook it but I cannot use frozen, or canned foods for this one day. I cannot add things that come from bottles or cans to flavor it. My kale will have to be whole leaf and not pre-washed and cut. Carrots will be full size and not whittled down to baby carrot at some factory. Nuts will start in the shell. No milk unless I can milk the goat myself. (there are no grass fed cows in Florida). I am not going to become a raw eater or a true unprocessed food maven. I know myself too well to believe I would ever go that route. I am planning to do this on Thursday. (this was written on Monday). Thursday is a day when I can have all three meals at home, which will make it easier and it gives me time to buy what I will need. WHY am I doing this? I want to be more mindful of the food that is going into my body: the real versus the manufactured. I do not know if I want to make this a future practice so I am limiting it now to one day. One day. Three meals and a snack. Nothing processed. If you have done it successfully, please share your thoughts and tips. If you have tried it and missed the mark, please share your experiences. I understand what you mean, Jane, but there are different levels of "processed," and if you're eating food from a grocery store, there has been some level of processing done to it. Unless you're going to raise chickens, pigs and salmon in your backyard, raise a dairy cow to get its milk, grow a grain field, grow a complete vegetable garden from seeds you get from an organic source, plant an almond tree, build a smoker to make ham, etc., and "process" it all yourself, *something* has happened to the food to get it from its origin point to the market and then to your table. Choosing the best options (yogurt with one ingredient, peanut butter with one ingredient, skim milk from a local farm) is more than 99% of your contemporaries are doing...you're making the best possible choices in a modern world based on the most current wisdom about food/nutrition. @Norma: That's the point of the day - just one day - to see just how far little food i can find that comes from the ground without it making a detour to te FrankenFoods Factory. Hi Jane! Well, on most days I eat scrambled eggs with green peppers and onions with a processed slice of cheese on top, a super huge apple, and up to 4 packs of oatmeal with processed maple flavoring, and a little bit of mini-choc chips. And I call that a good day. I go so much worse every once in a while. I don't have a comment about your challenge other than to say good luck! But I do want to thank you for some awesome posts and for sharing your journey. I just happened upon your site tonight for the first time and you are an inspiration! I've been feeling so very hopeless in my own journey and struggle with many of the same issues, especially food addiction. I've been searching for hope and I'm glad to say you are it! I've felt that I was too far gone to really make a lasting change but I see that you are doing it and that is very encouraging. Thank you! NICE AND A DIFFERENT EXPERIMENT. NICE IDEA. Emily GC: I hope you will visit often and ask questions or comment anytime you want. Knowing I am not alone gives me hope I will continue to keep my pounds off, too. @Norma: I use Splenda. That is a Frankenfood. There are a few small items in my foods that could be considered Frankenfoods: truvia, The occasional Crystal Light beverage, and I chew gum. While you are right, these are nothing when compared to the general public I do feel I could use a tweaking every now and then. Today's 24 hours of single ingredient foods is just a one day exercise to see if it is reasonable with my lifestyle and what I consider healthy percentages for carbs, protein and fats. I can tell you right now - the protein is much lower today (and today only) because I won't eat fish unless I get it whole. I guess I could buy a live lobster but I have never been someone who could choose the lobster to be cooked so forget that idea. Again, I am only trying to do this for one day. It is very interesting - I cannot use the salt I have in the house. The canister of salt contains salt and four other ingredients. - who knew? Interestingly, the first month I went from weight loss (artificial sweeteners and Medifast) to Paleo/Primal I was able to drop Equal from my coffee overnight one day. I think it had something to do with my bodies response to sweet. I thought it would take a lot longer to switch off the Equal. Looking forward to the outcome of your experiment. 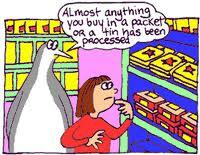 Even though I say I eat unprocessed, there are processed foods in my diet. Just not many and no junky triggers. Great experiment. Much to be learned from individual foods and how you feel physically and mentally. found you through another blog. I was unclear on what processed foods include. The cartoon made it very clear!